Meanwhile, the Lima Group – a collective of 14 Latin American nations – has accused the administration of manipulating the elections, declaring the results “illegitimate” even before the ballot has taken place. Such accusations overlook Venezuela’s long history as a pioneer in electoral fingerprint technology and regular audits to guarantee transparency andeliminate voter fraud. The South American country’s elections have been some of the most internationally observed since 1999, when Hugo Chavez first won the presidency. Venezuela also introduced the world’s first fingerprint electronic voting machines, eliminating almost all possibility of electoral fraud amd coinciding with Chavez’s anti-corruption and anti-poverty campaigns. Over 63 percent of the population turned out to vote on December 6, 1998. Chavez won with an overwhelming 56 percent of the popular vote, carrying 20 of the nation’s 23 provinces. So began a 20-year trend of transparent and fair elections, throughout which Venezuela has maintained one of the world’s highest voter turn-outs. Following Chavez’s inauguration in 1999, Venezuelans moved to rewrite the constitution and filled 95 of the constituent assembly seats with a Chavez-led coalition. OAS observers approved, saying: “The entire election, from the opening to the close of the polls and the ballot count, was fully transparent.” The constitution was approved by 71.8 percent. 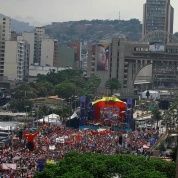 In 2004, opposition leaders announced a petition for a referendum against the legitimacy of Chavez’s administration. Signatures poured in and the opposition won the right for the 1999 constitution to be recalled. The president’s progressive proposals would have extended social security to the self-employed and informal workforce, lowered the voting age to 16 and given equal access to city services. However, the final tally of votes showed a narrow win for the right with 51 to 49 percent. It was the first major win for the opposition during the Chavez administration, but the president accepted defeat with grace, not once proclaiming ‘fraud’ or other voter irregularities. In 2015, the main Democratic Unity Roundtable (MUD) opposition party ran in the legislative elections and won by a landslide, taking a two-thirds majority in the National Assembly. It marked the right-wing’s first win since before Chavez’s election in 1998. In responde, Maduro’s government immediately opened makeshift polls in stadiums and other public areas. The opposition and international leaders continue to contest the legitimacy of the ANC and the timing of this year’s May 20 elections. The United States has imposed sanctions against the Bolivarian nation and claims the general elections are “neither free nor fair.” Canada has gone so far as to ban Venezuelan embassies from installing polling stations. Such actions completely disregard international law; Venezuela’s long history of acclaimed clean and fair elections, and the fact opposition leaders themselves proposed the date of the elections.